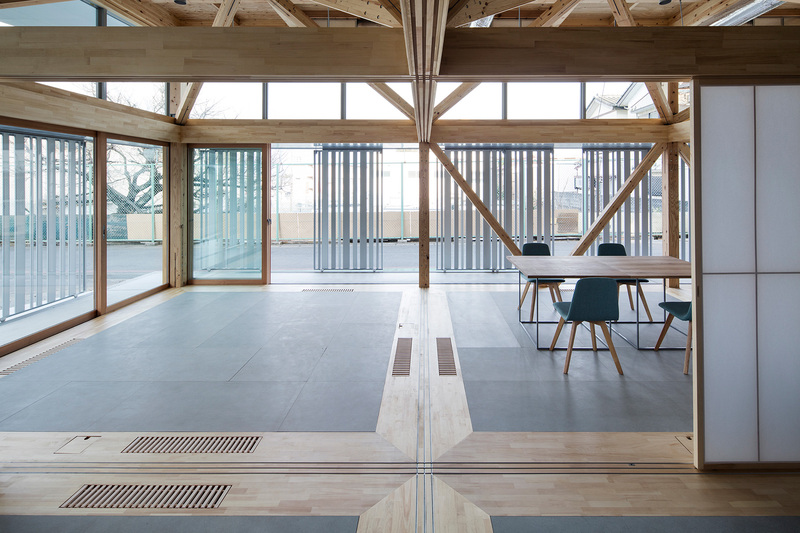 This is an extension to an existing circuit board factory located near Atsugi base. The first floor area, which had originally been planned as a workshop, was changed to be used as a showroom and a multi-purpose space for local community, and therefore versatility and openness were required. 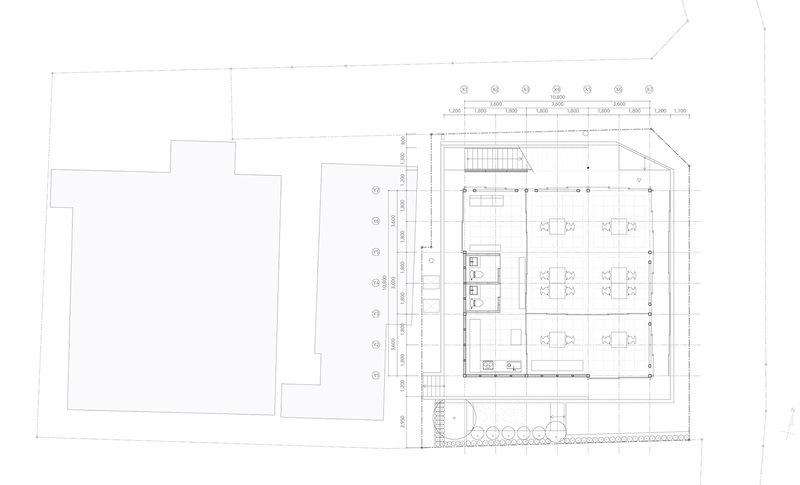 Furthermore, since future reconstruction of the currently used factory building was under consideration, we tried to design an extension allowing for multiple uses, while providing adjustable spaces and programs in accordance with the active involvement of users. 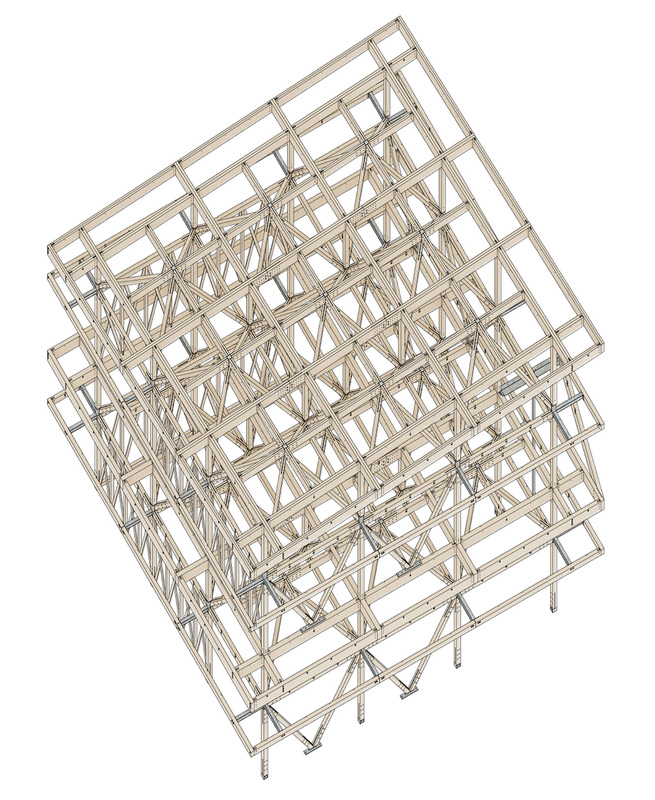 This building is constructed of a frame structure model designed to accommodate various conditions and requirements, as well as fitting and hardware elements allowing fine tuning by improving their adjustability and renewability. 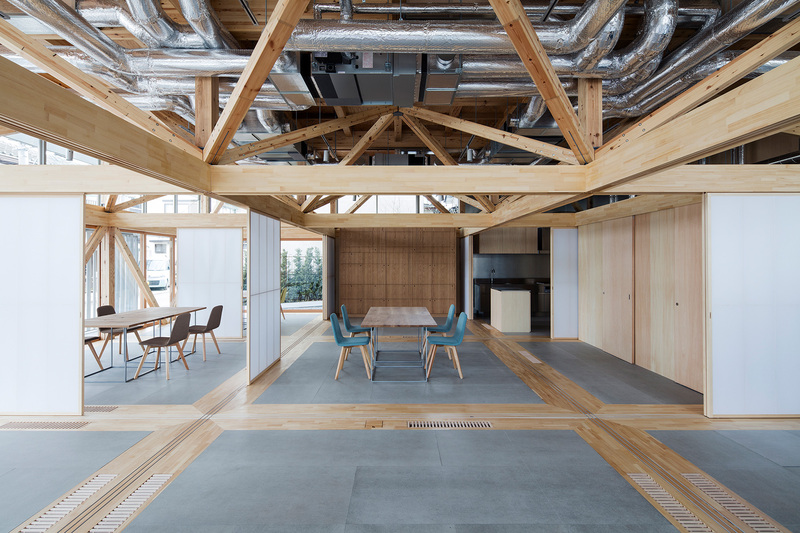 Those spaces in the building are characterized by the composition juxtaposing those elements without losing their original characteristics. The site is categorized as semi-industrial zone, where factories and residential houses coexist. 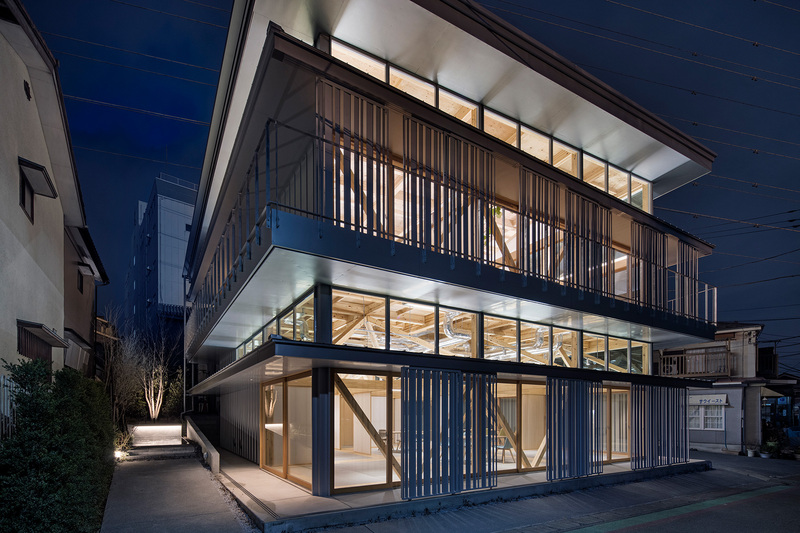 A factory is a closed program in a city environment, mostly constructed of steel frame structure covered by exterior walls made of industrial materials; a house also has tendency to be closed in order to maintaining its privacy. 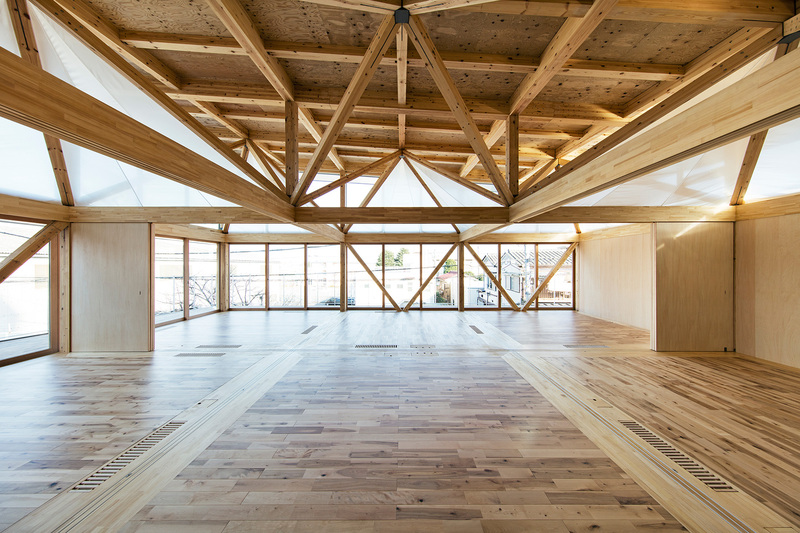 As a result, those two programs have little chance to get mingled with each other―in a positive sense. 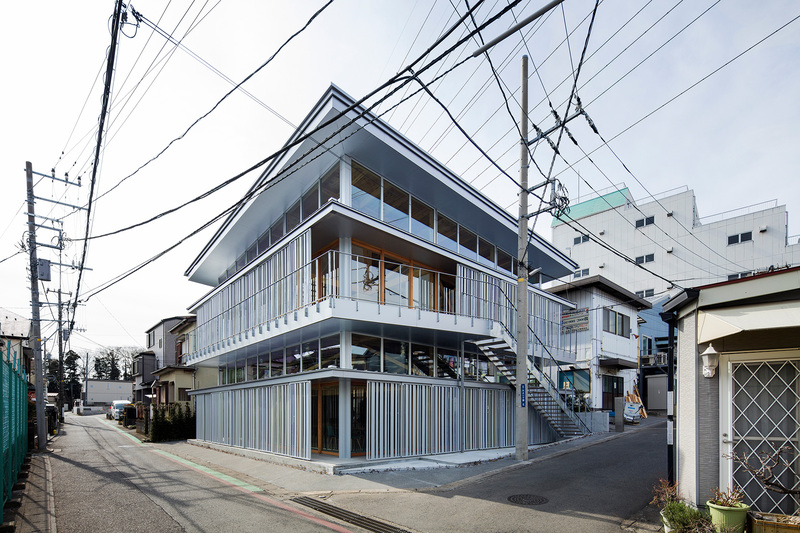 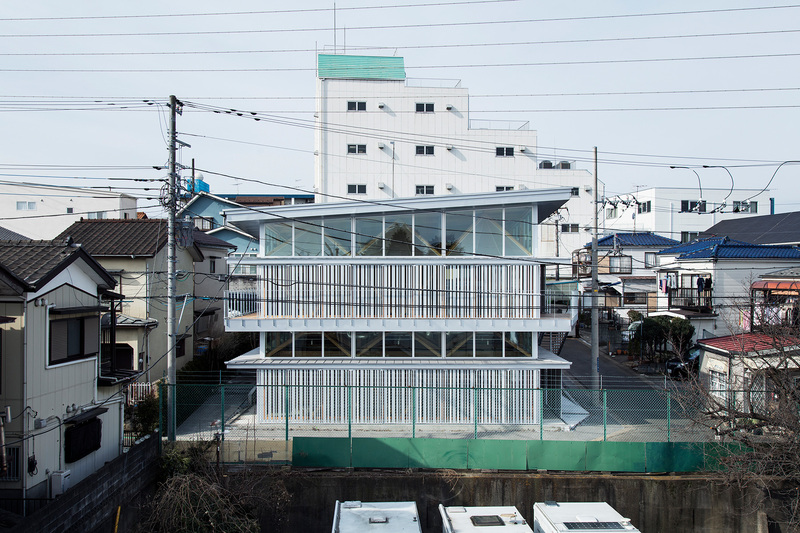 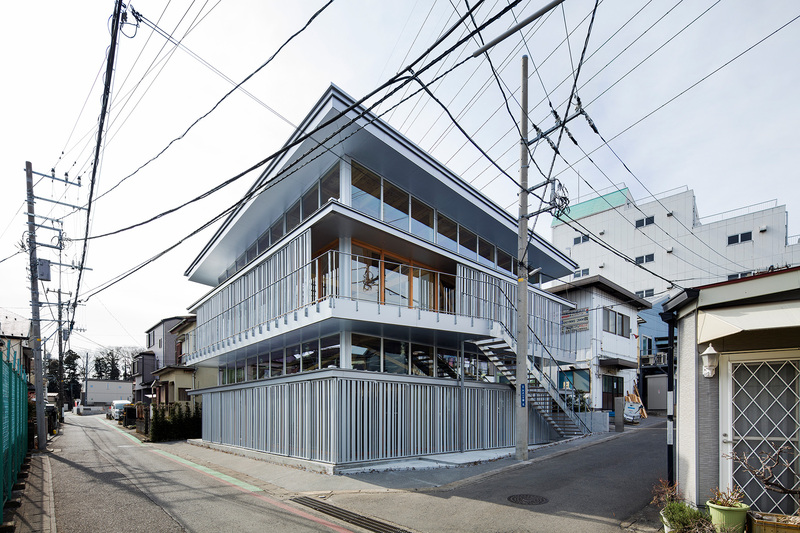 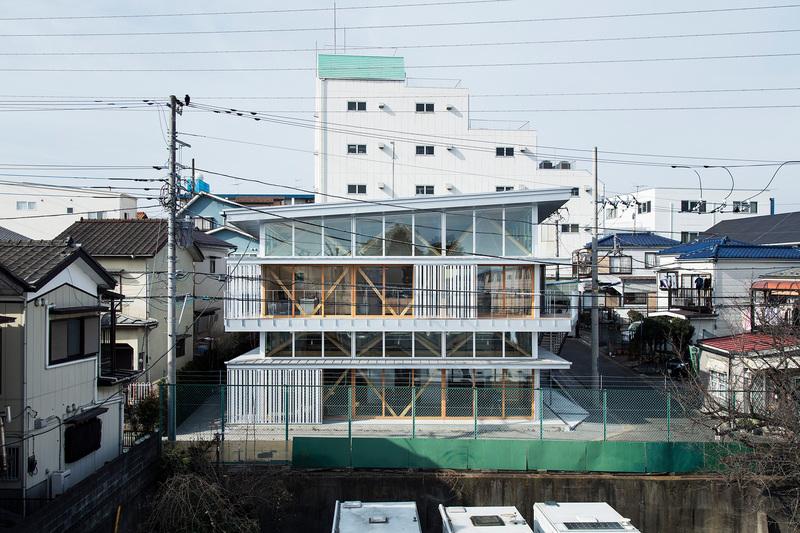 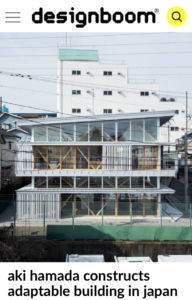 The house adjacent to the site has a daily life in which family members sundry the laundry or walk a dog. 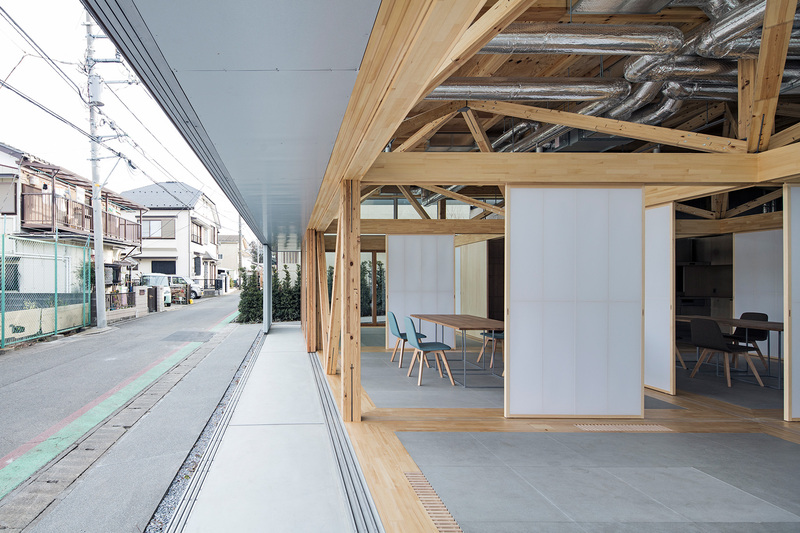 Then, together with the client, we thought about how a factory should be standing next to such everyday scenery of the neighborhood. 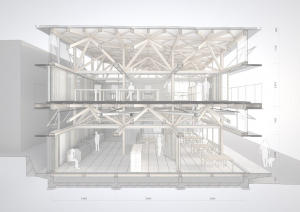 As a result, we came up with an image of an “open wooden-structure factory” that mediates the relationship between a factory and a house. 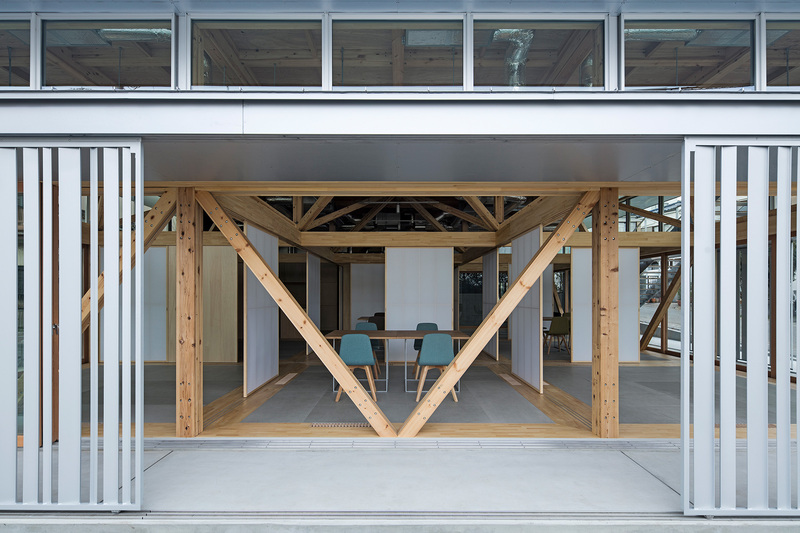 We expect that this place will be accepted by the local community as a place where people gather, while changing day by day with the active involvement of various people. 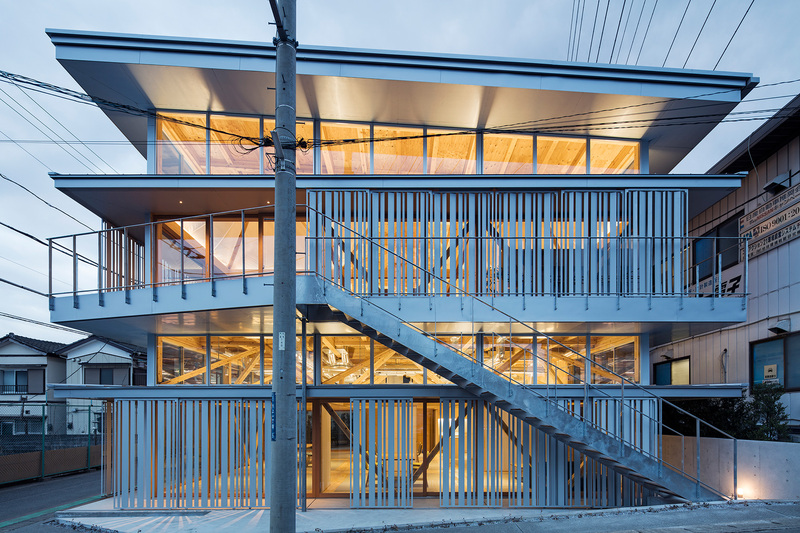 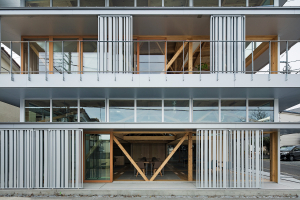 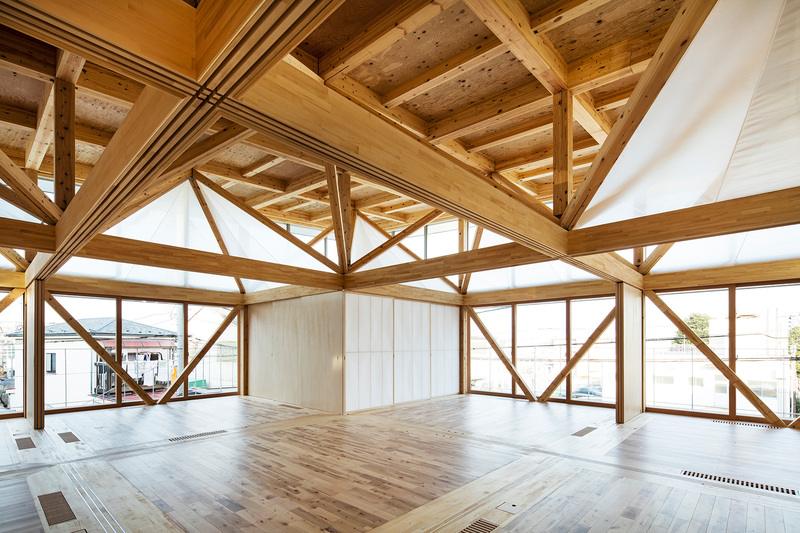 Once we came up with the image of the “open wooden-structure factory”, the next challenge was to practically realize the building in terms of structural and constructional integrity, without sacrificing the living environment and its comfort level. 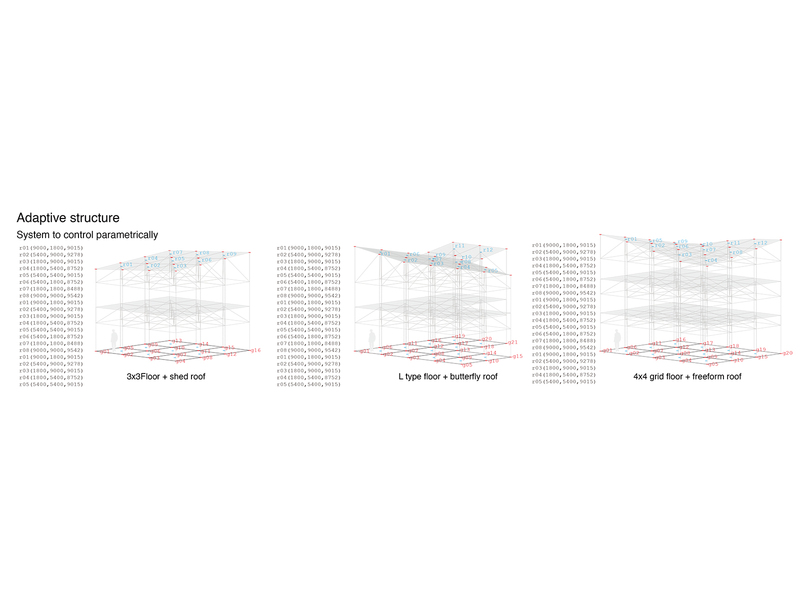 Then, we set up a program for various elements to be determined by adaptively modifying them according to the conditions―that was named as the “adaptive model”. 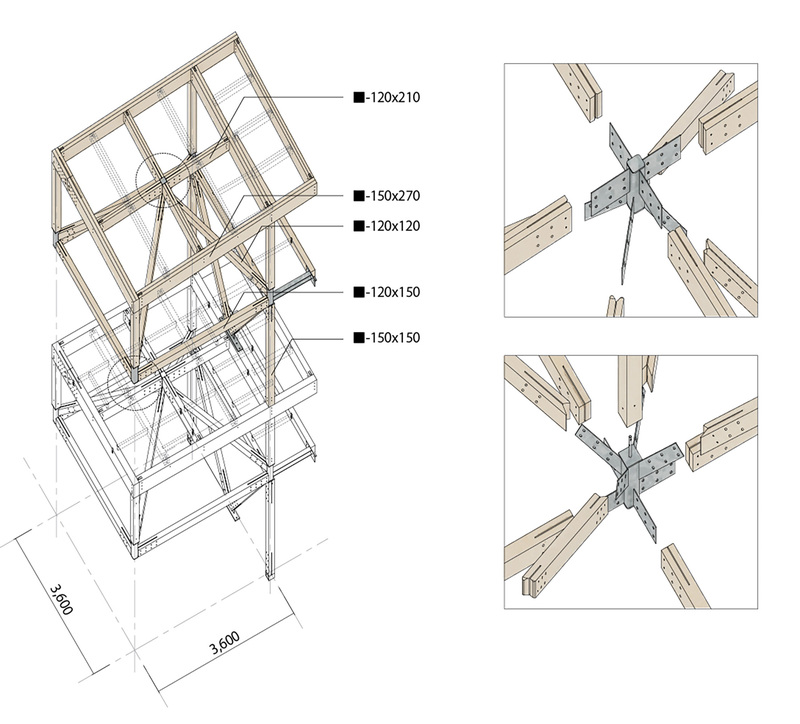 We made final decisions for the output variations in terms of constructional and aesthetic aspects; there are numbers of possible forms in parallel existence, with freedom of going back and force within the process by altering parameters. 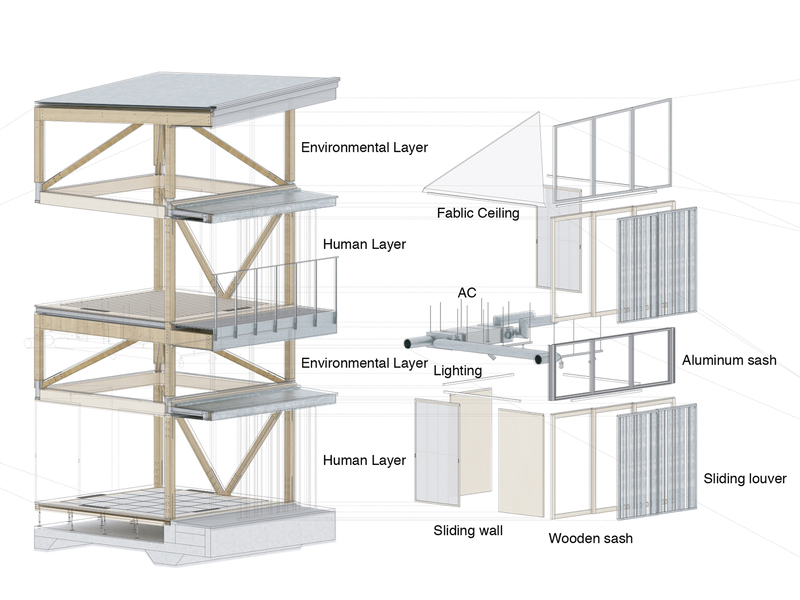 The living layer is configured with movable elements to ensure possibilities of various conditions of the space. 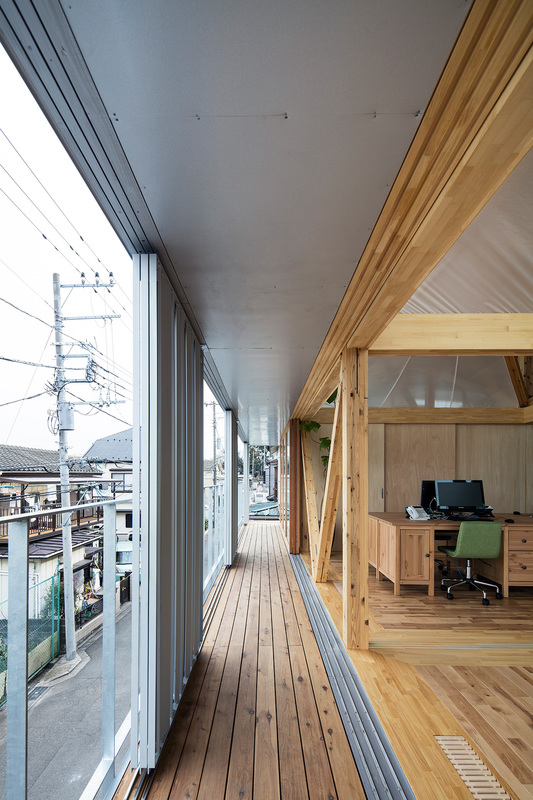 On the other hand, the environmental layer was given certain restrictions derived from structural evidences considering various possibilities, because it is the area not easily accessible by the users and then supposedly valid final decision was made based on an aesthetic point of view. 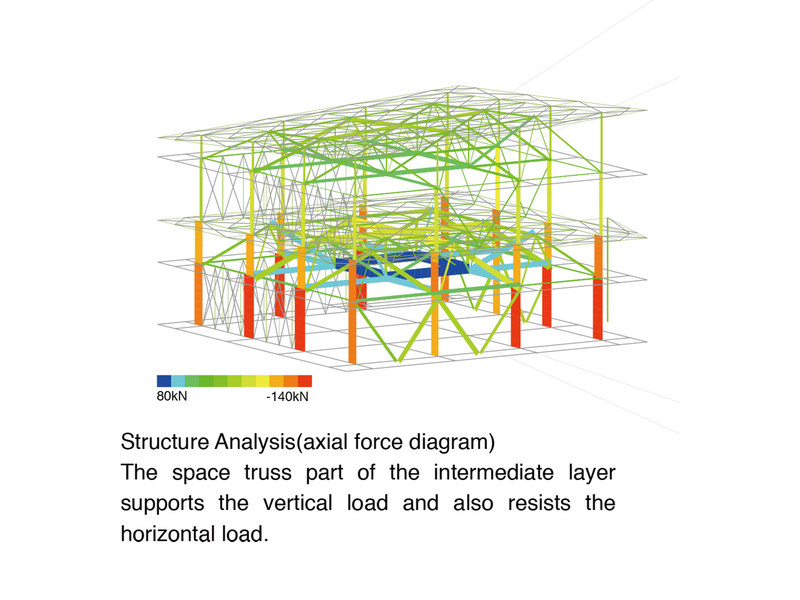 While we did not conduct a physical model study, we applied a method of parameter modeling allowing a free handling of information; this enabled us to simultaneously study the conditions of the space in terms of aesthetic and structural point of views in higher precision. 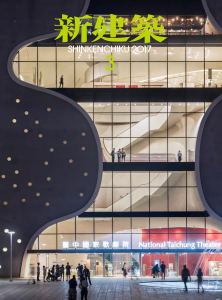 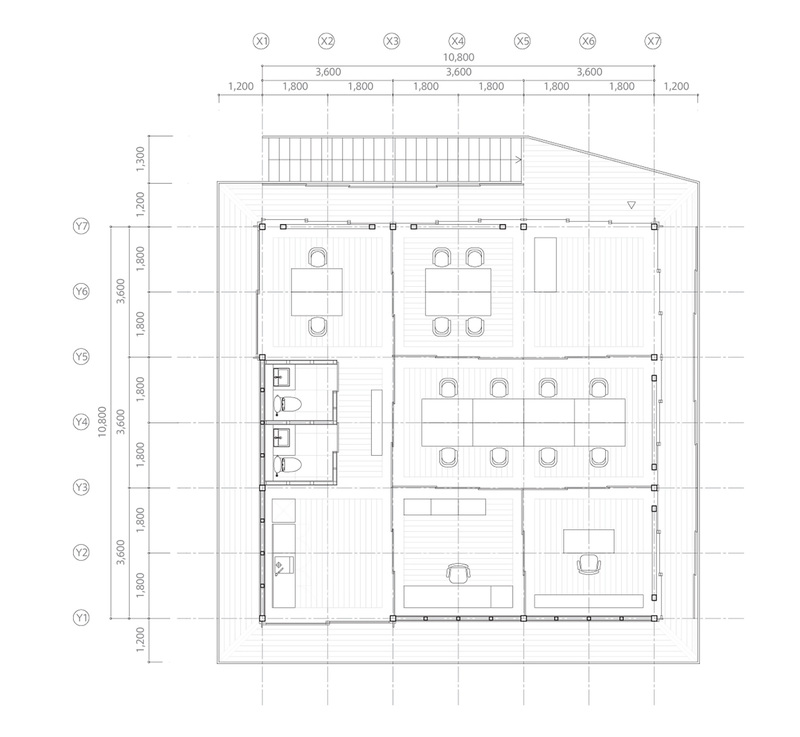 In this project, it was important to allow free establishing of input format by using general-purpose 3D CAD and programing, rather than utilizing an application such as BIM software with predefined input format for our design process. 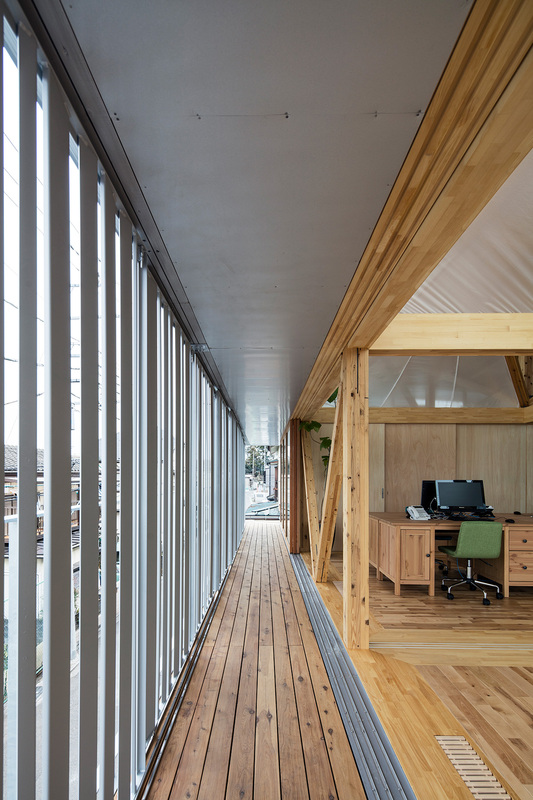 It is possible even for a small design office to increase the depth and density of architectural design by utilizing certain technology, with objective comparisons and studies of a vast number of variations. 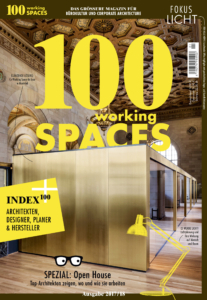 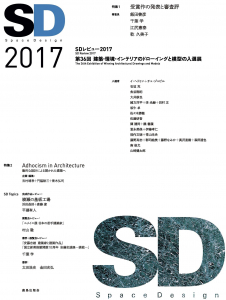 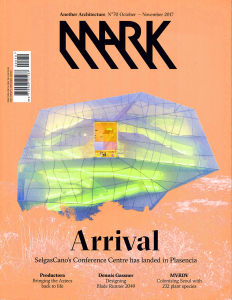 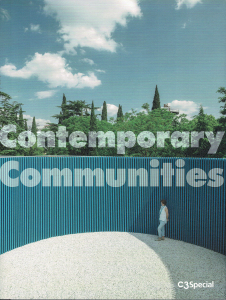 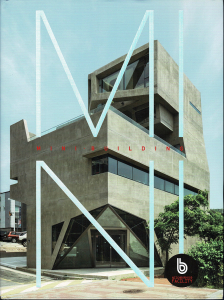 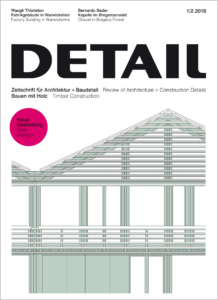 During this process, architectural and aesthetic criteria would achieve more significant meanings, and this is where the authorship of small design offices remains, which is the last stronghold that cannot be explained objectively nor verbally. 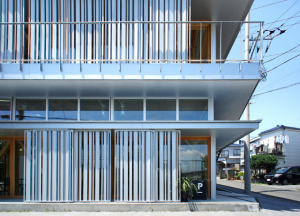 In order to control visibility from the road side and screen the daylight from the east side face of the building, exterior fittings are designed with the numerical aperture of 30% on the east side face against the morning sun, with 3 patterns of vertical grills by combining 3 different components, in 42mm wide/ 60゜ angle, 80mm wide/ 70゜, and 120mm wide/ 70゜. 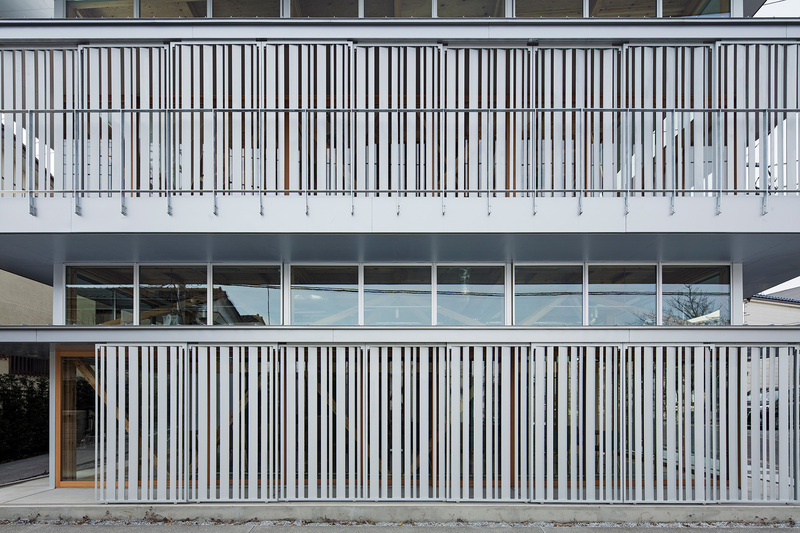 The orientation of each vertical grill is different on the east face and north face, responding to both issues of visibility control against the site conditions and daylight control against the environment conditions. 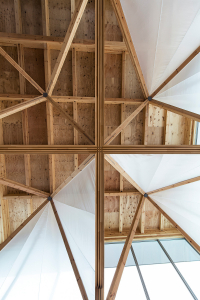 The aluminum sash of transoms above the canopy is partially operable. 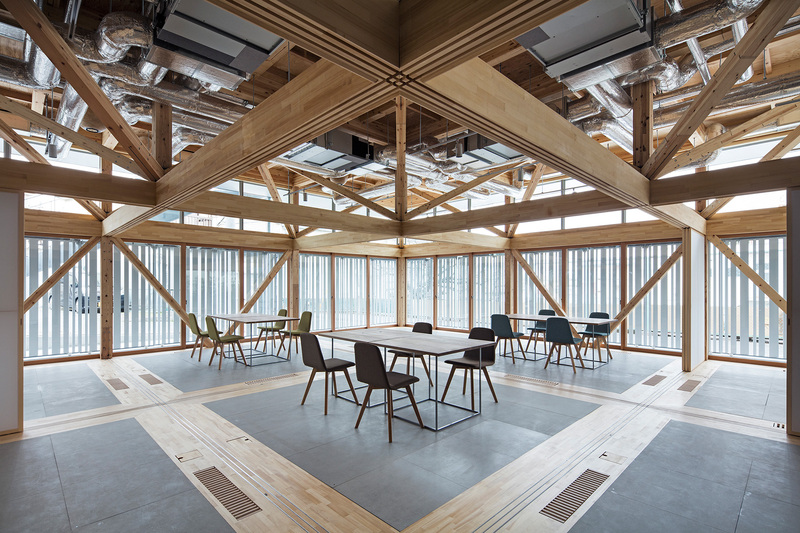 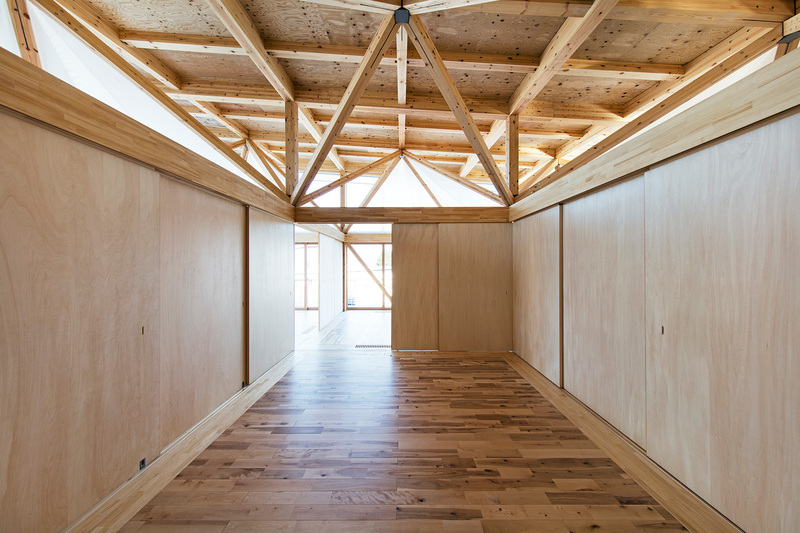 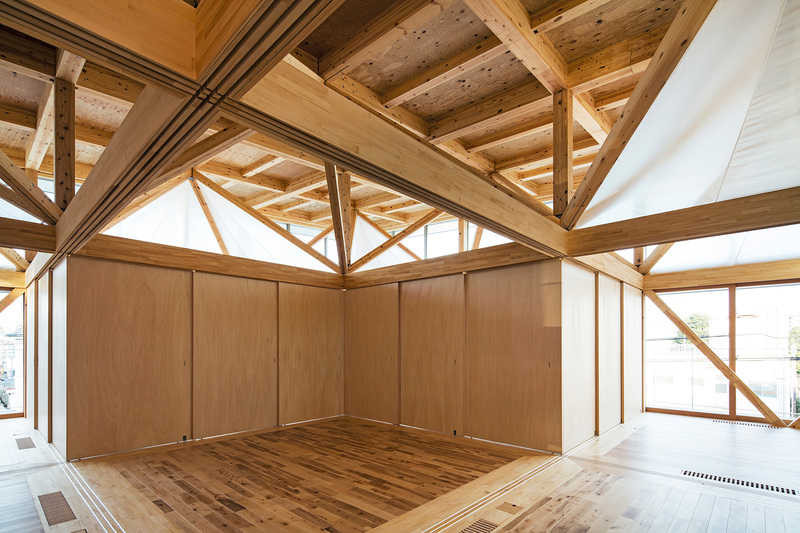 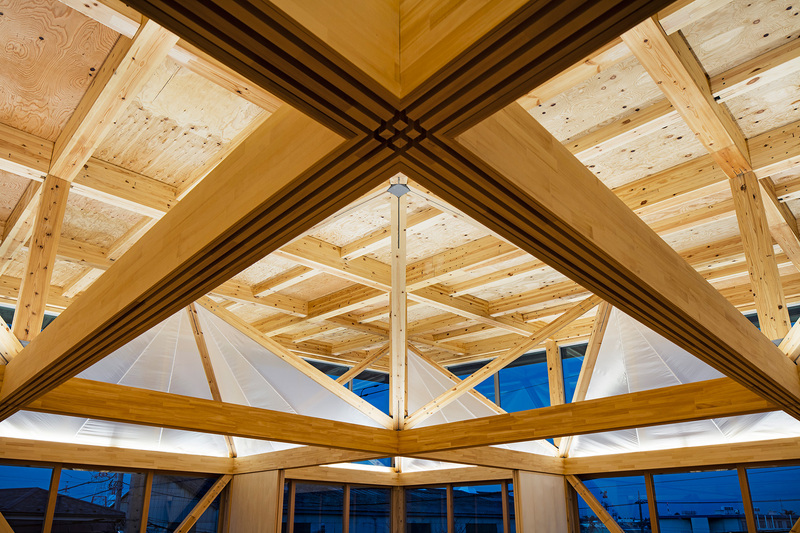 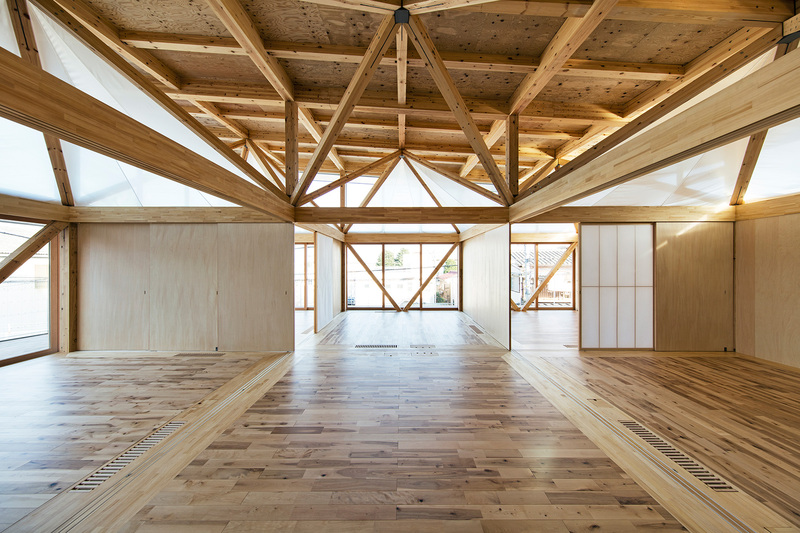 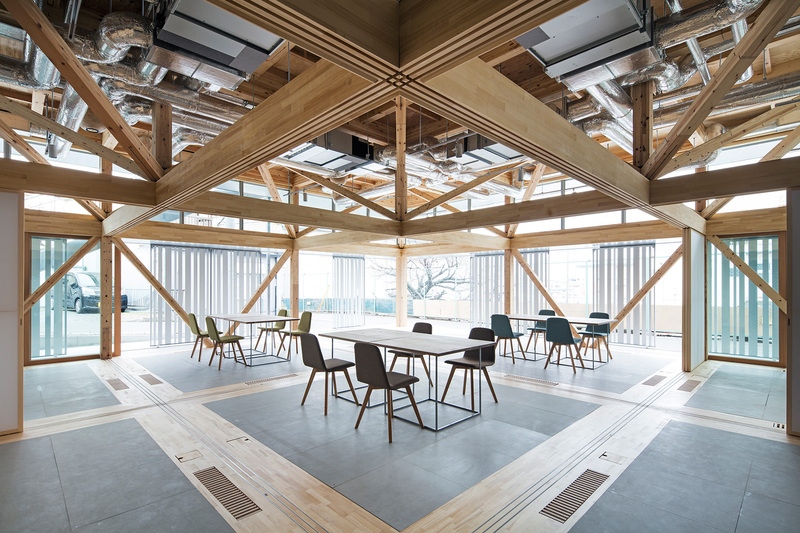 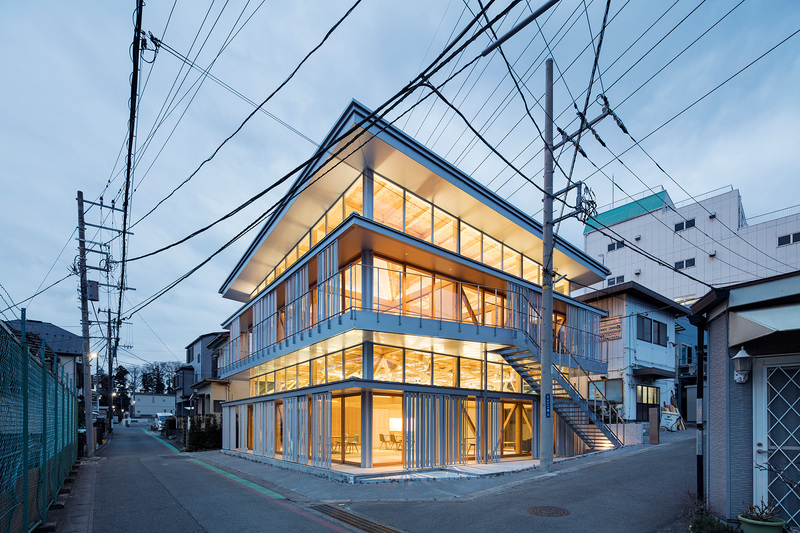 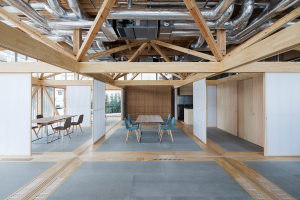 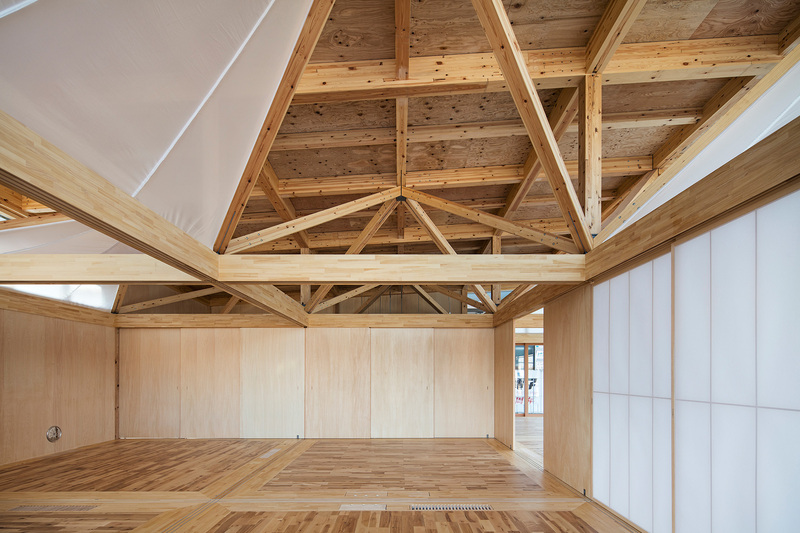 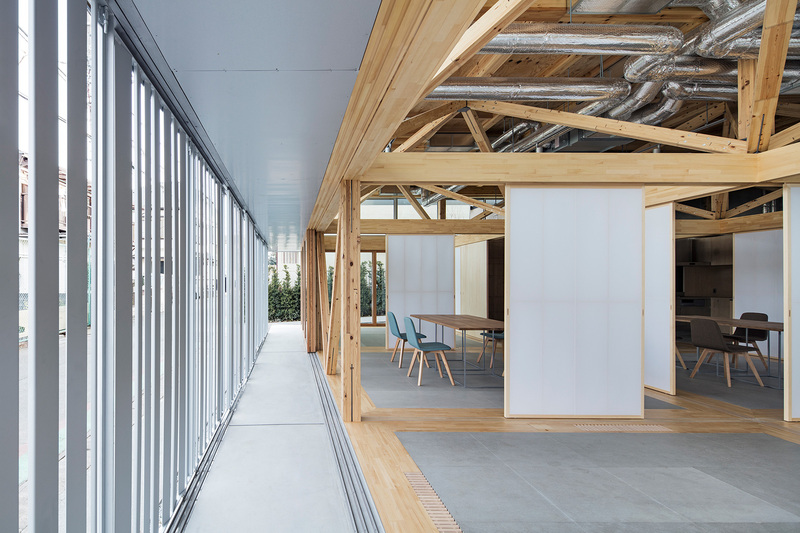 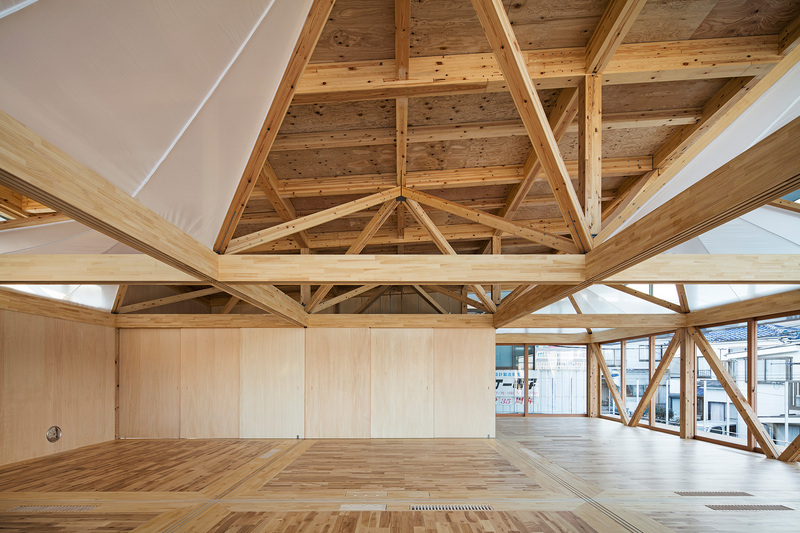 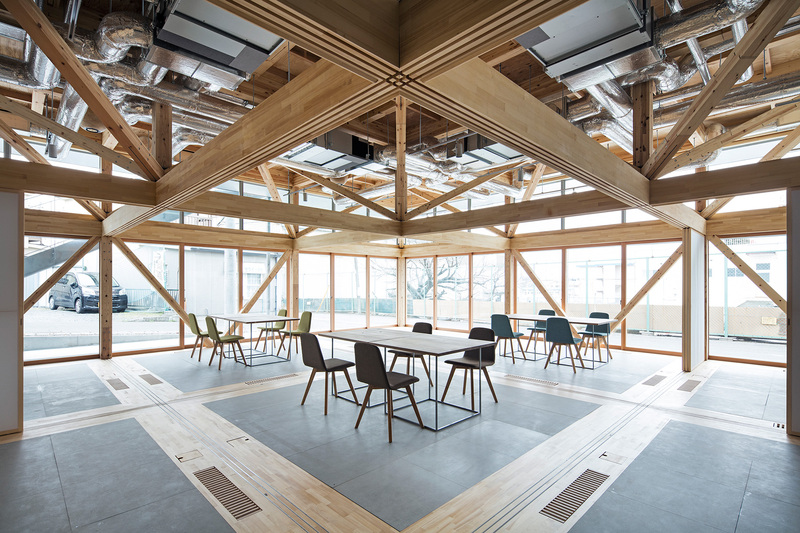 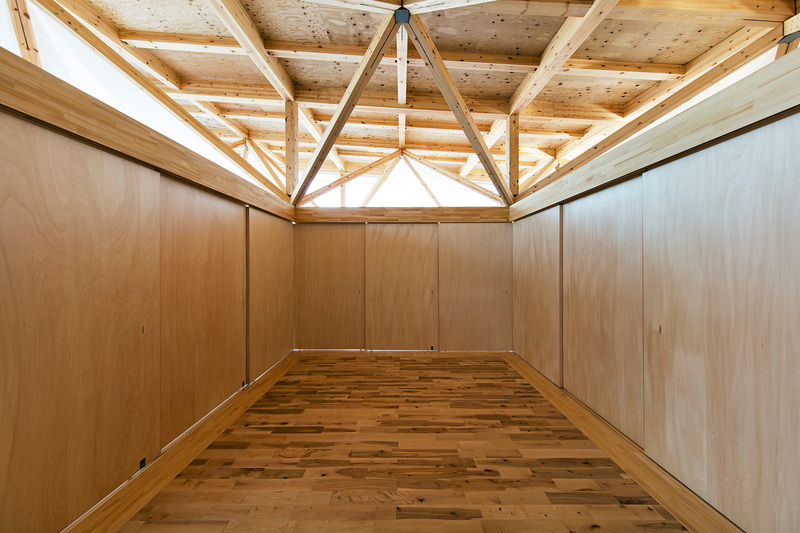 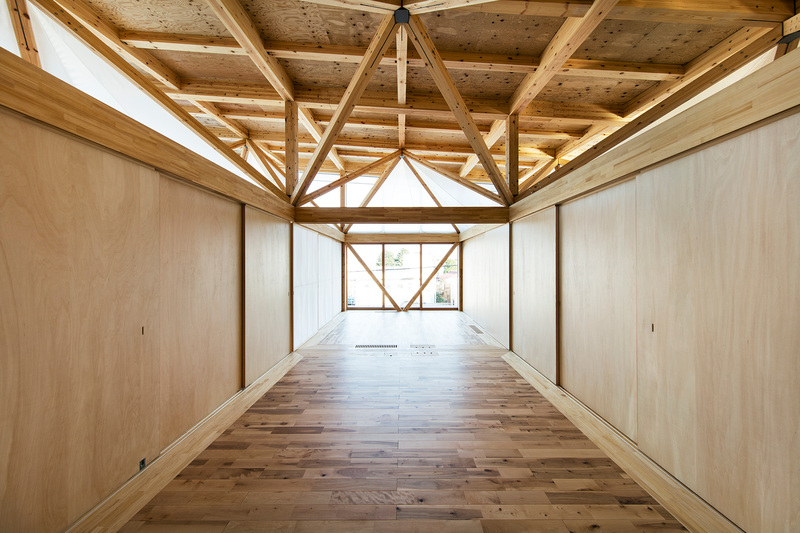 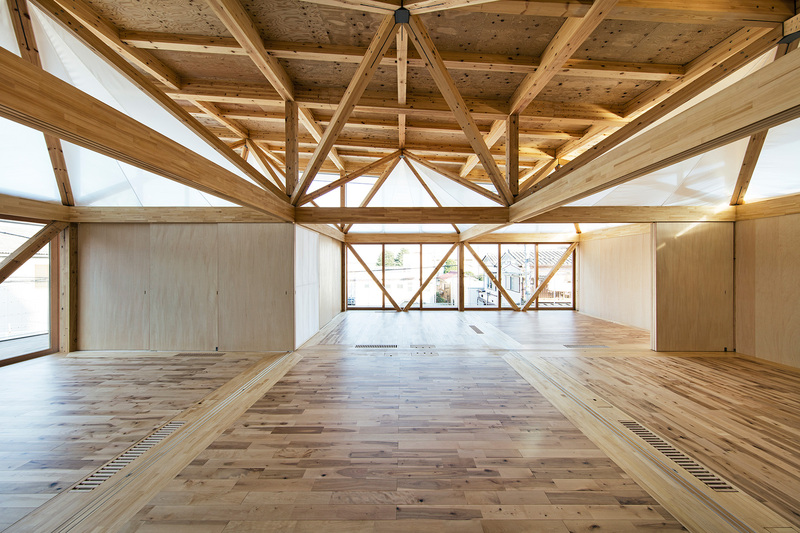 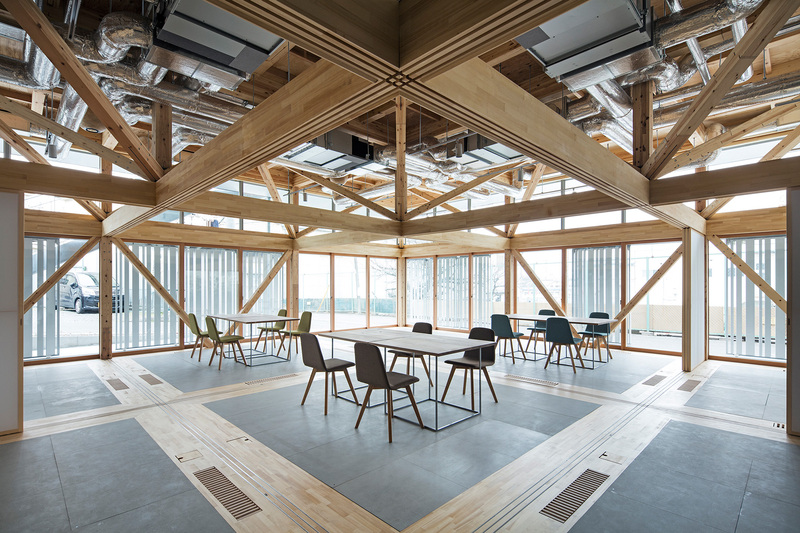 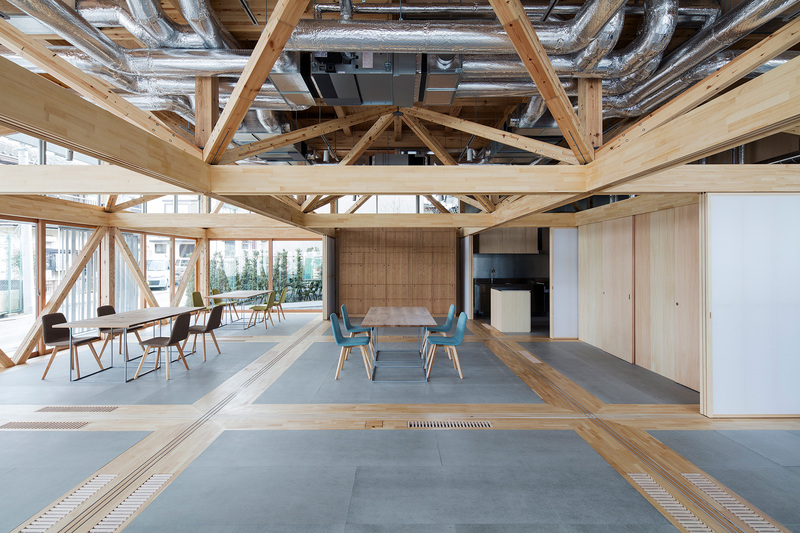 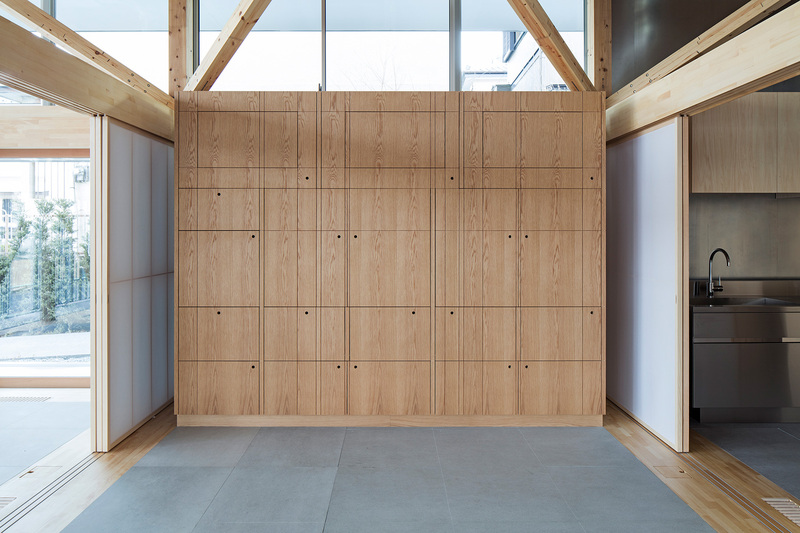 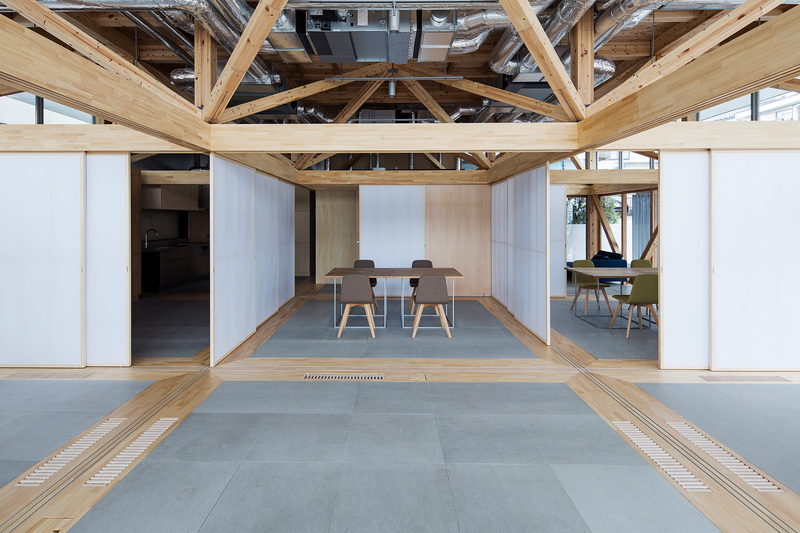 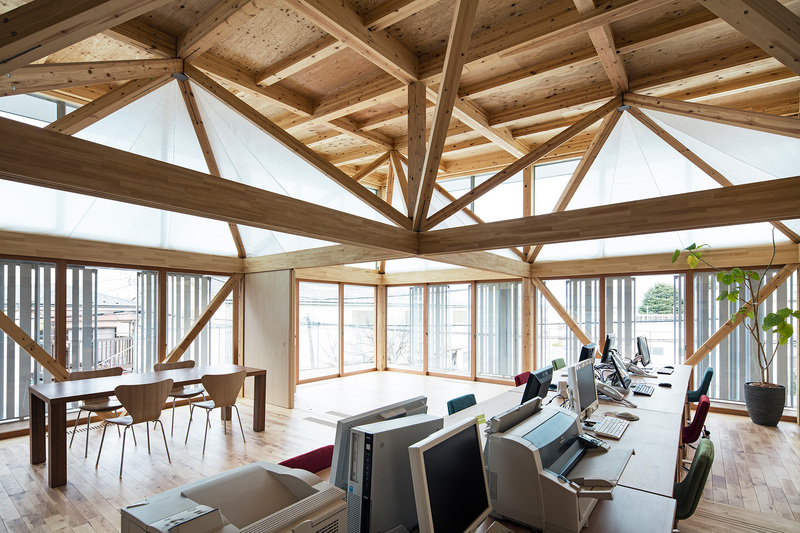 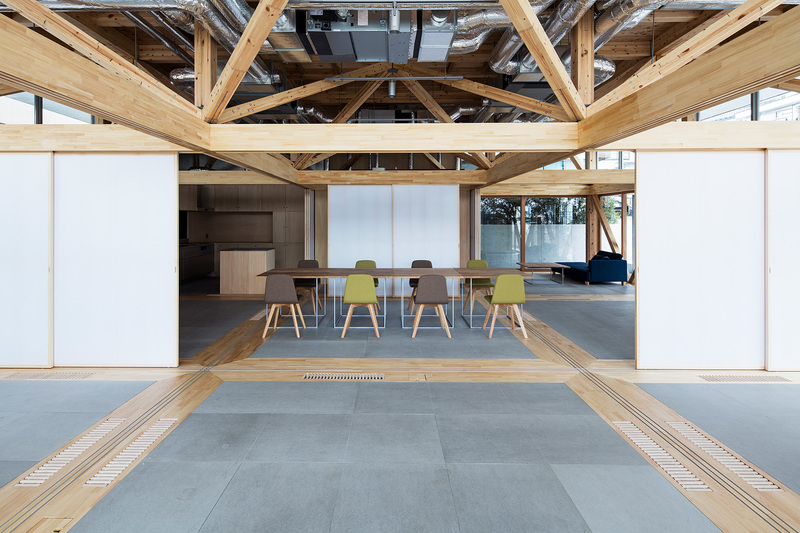 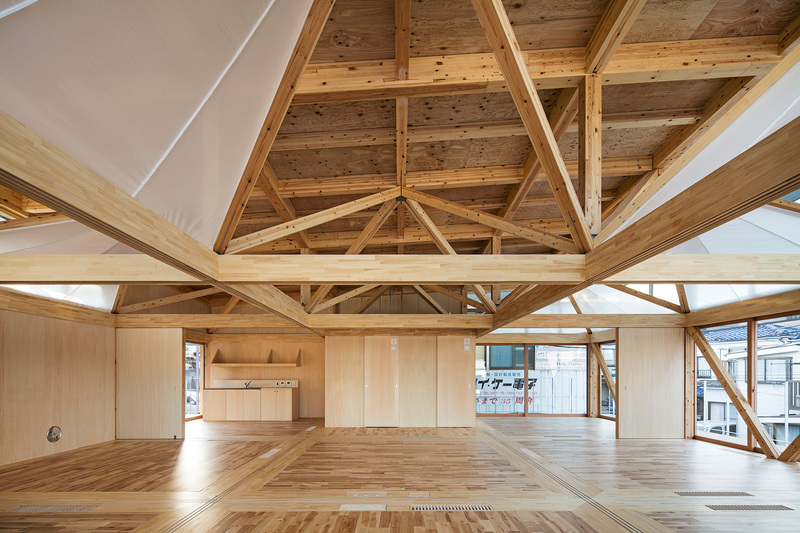 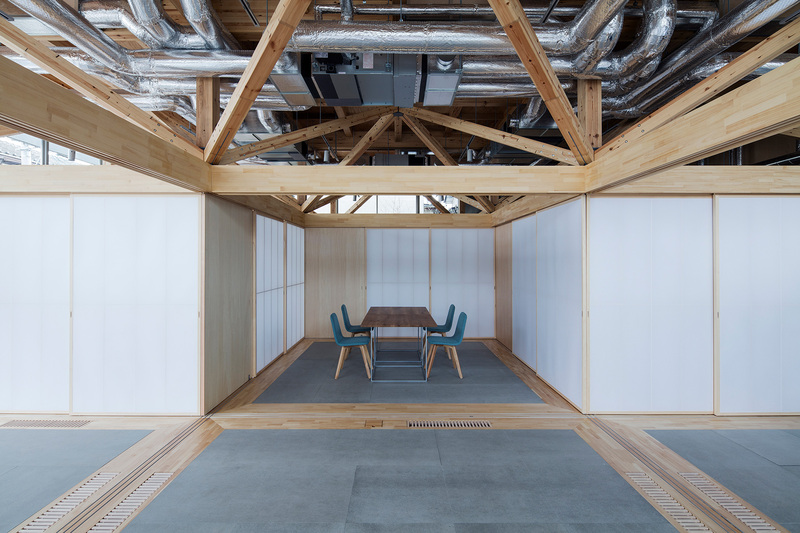 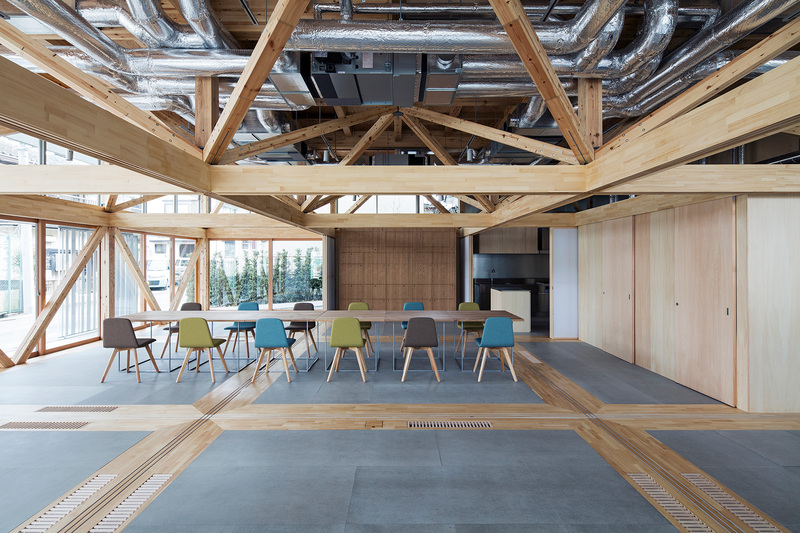 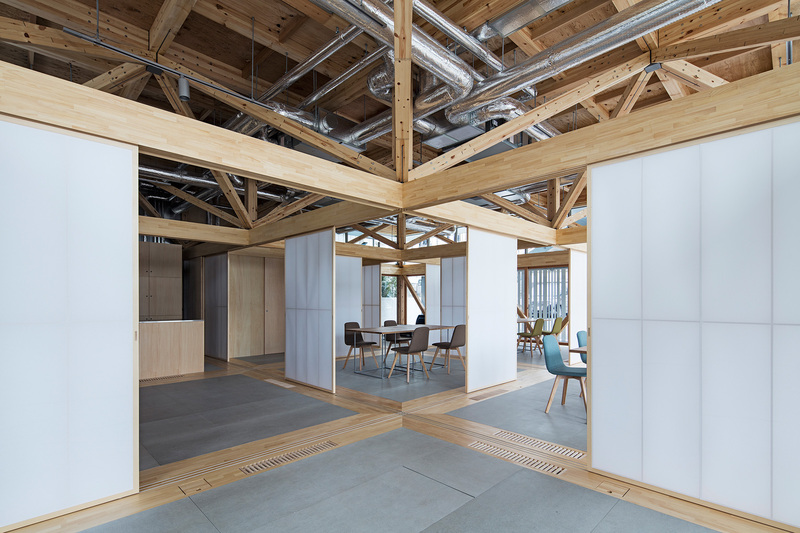 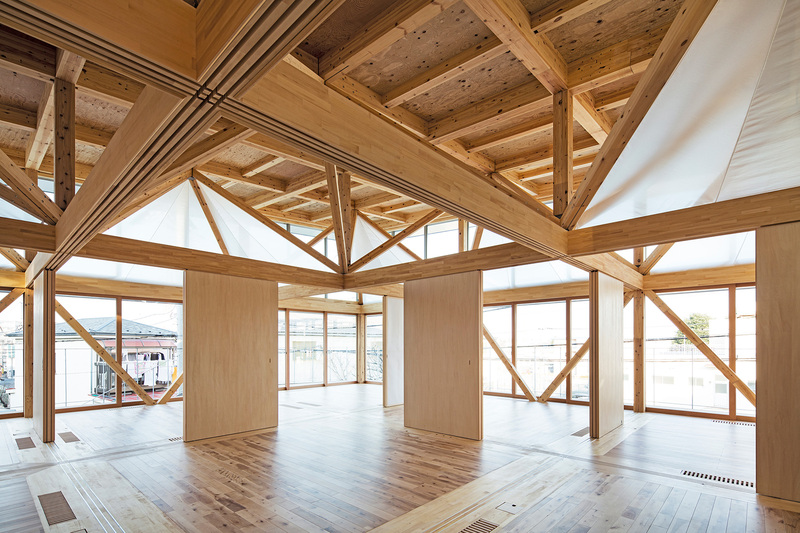 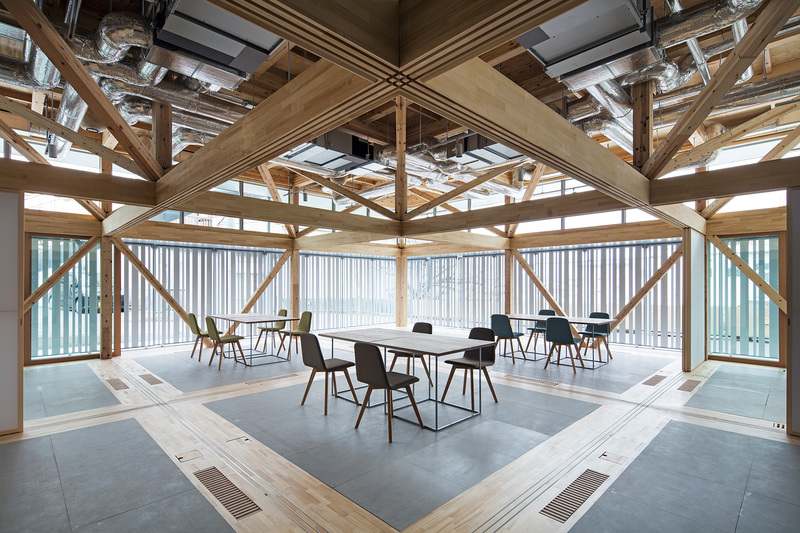 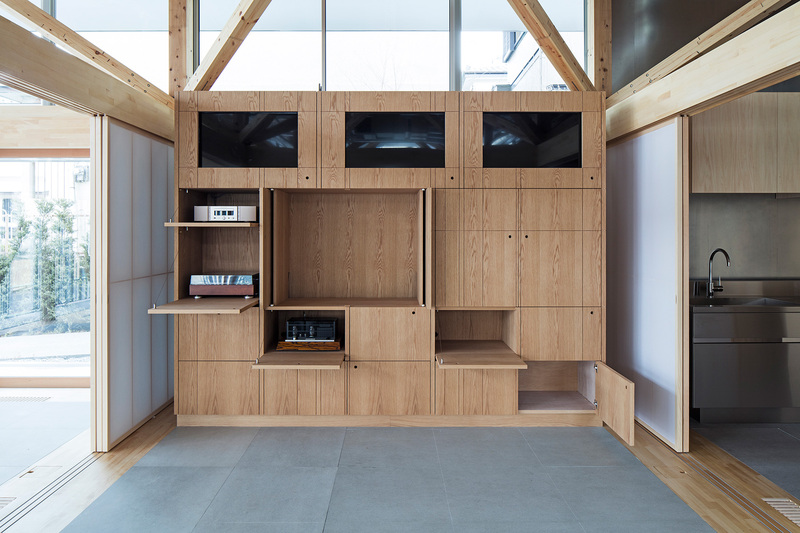 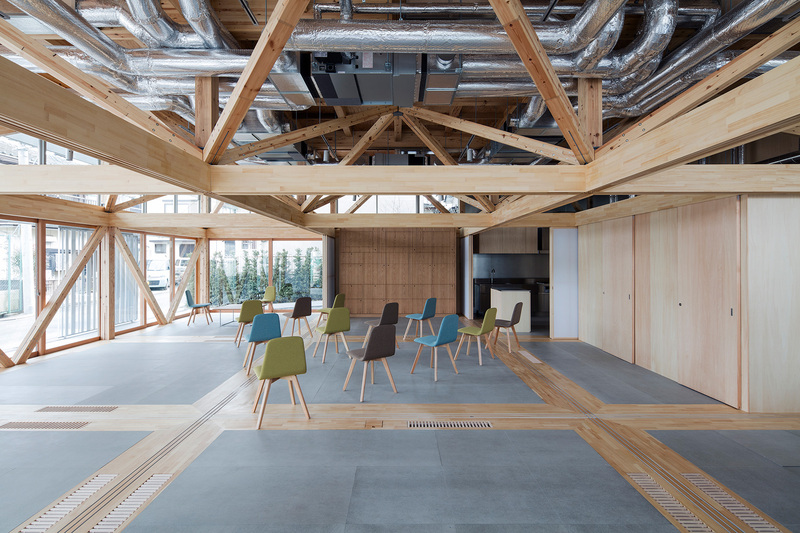 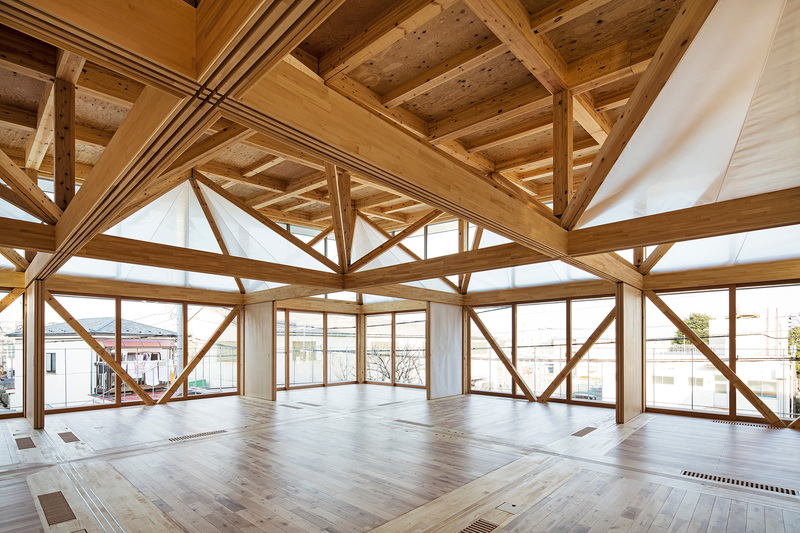 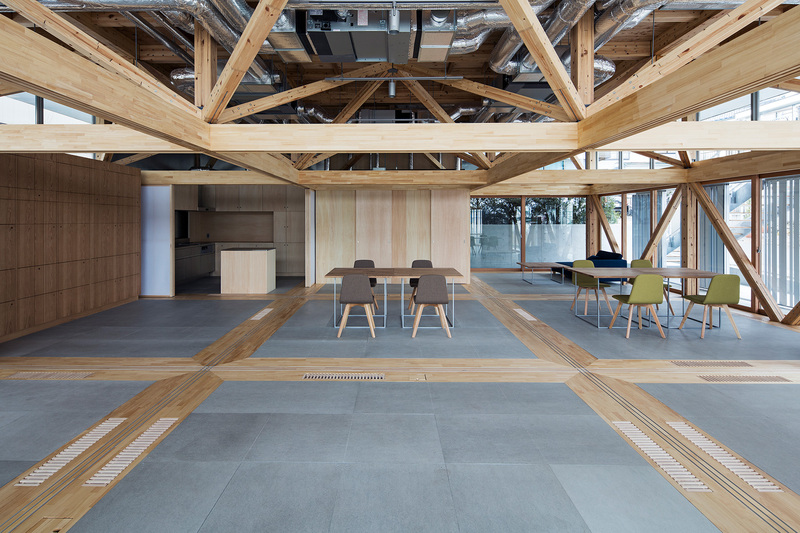 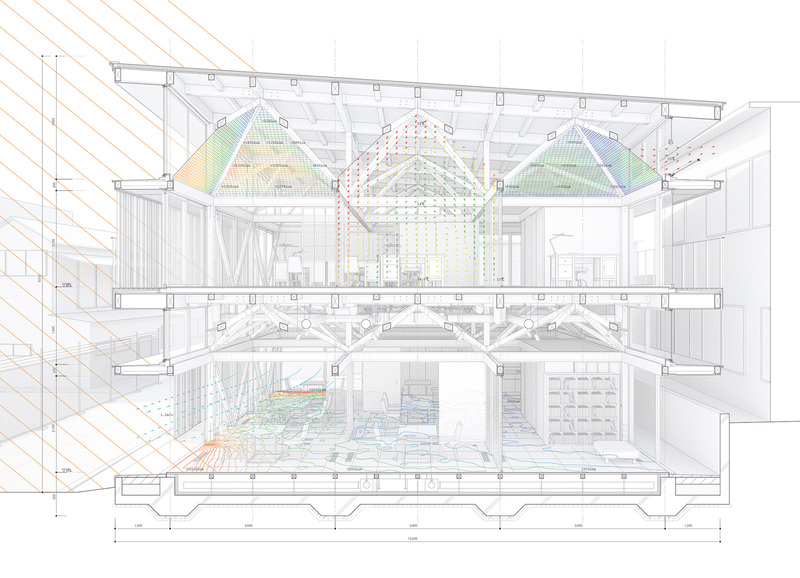 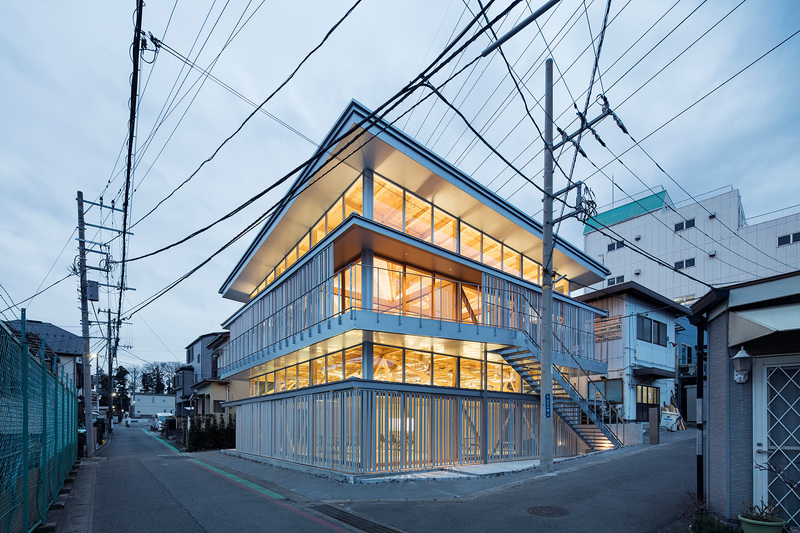 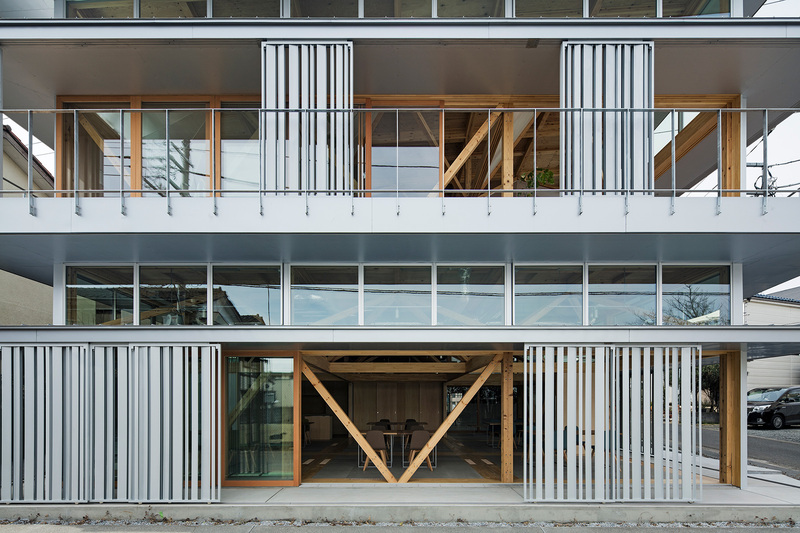 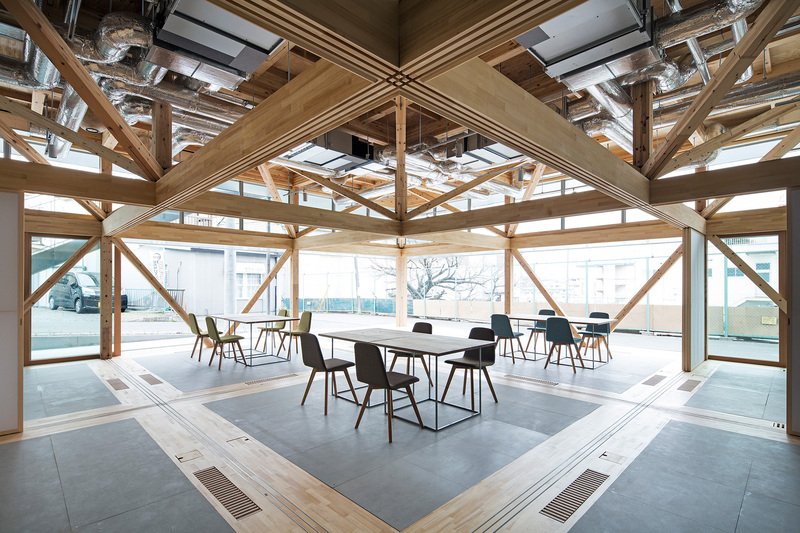 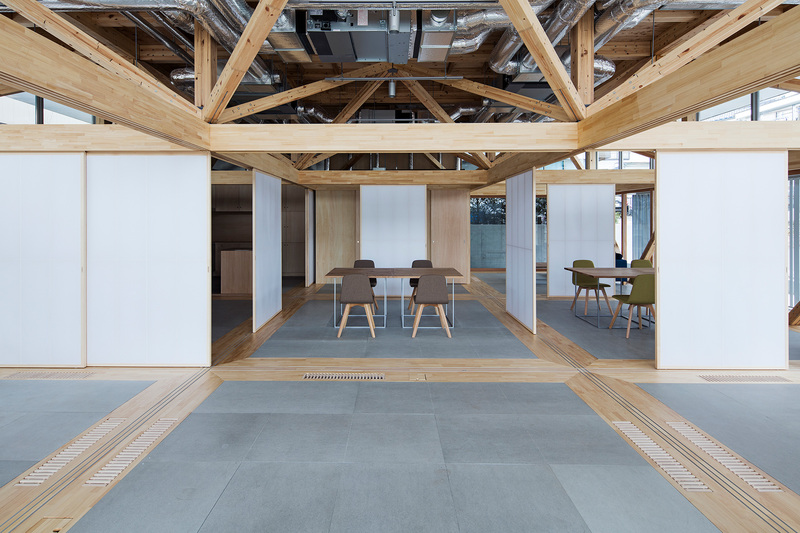 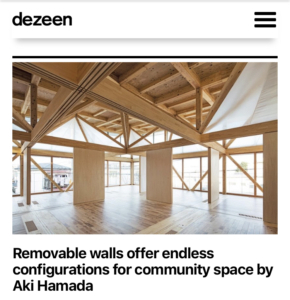 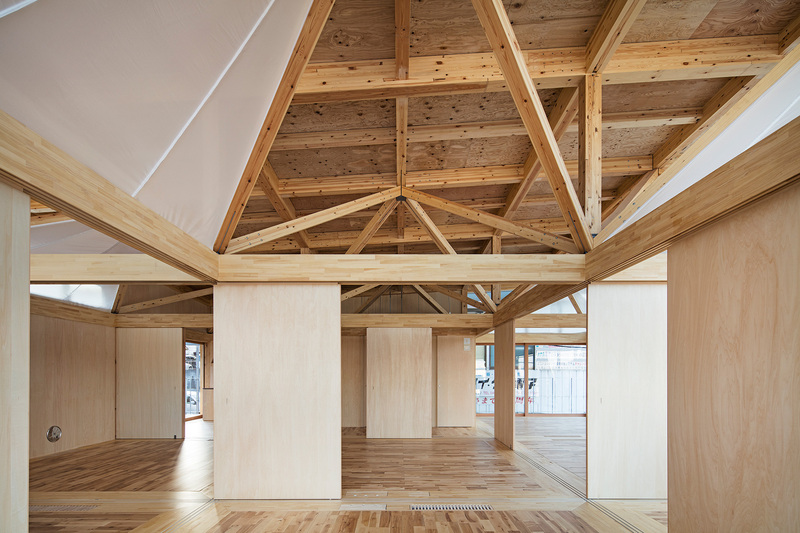 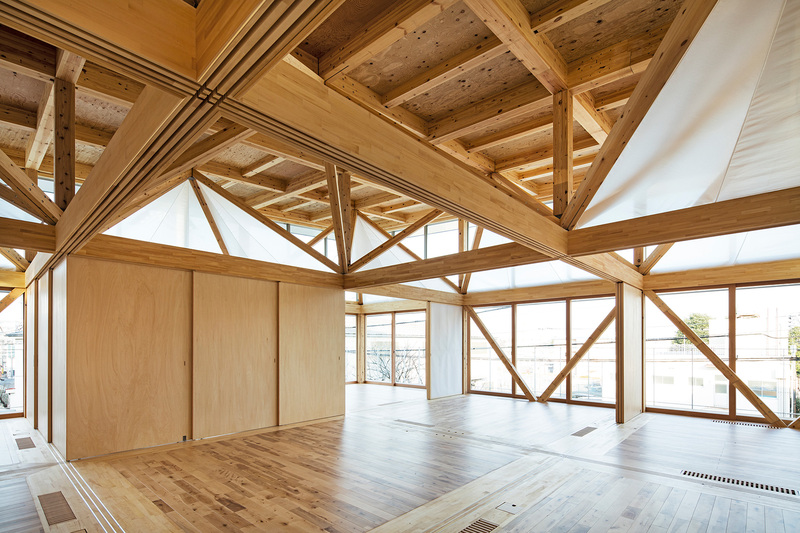 This building is an open-plan space where the entire space above the space trusses is connected together, while the dimension of the space can be largely altered by its fittings. 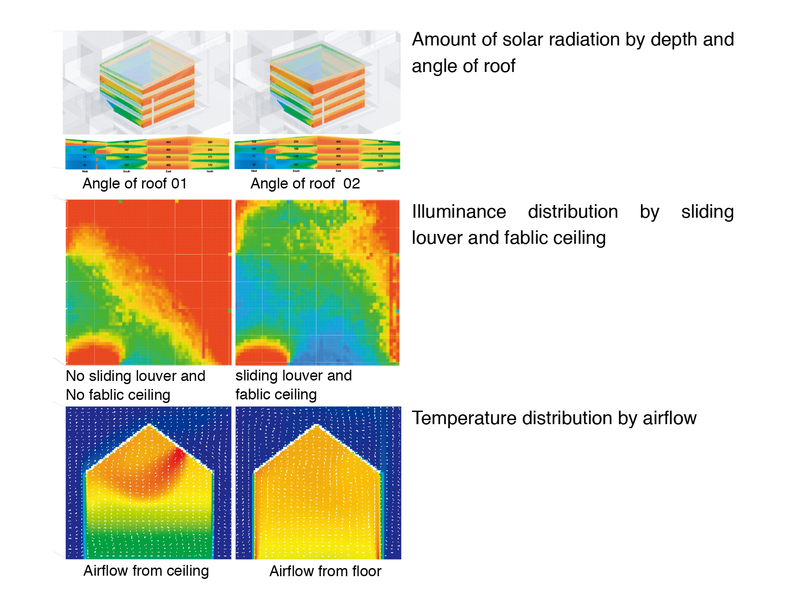 Since the air volume is large because of the high ceiling condition, typical air-conditioning planning with ceiling blowout method would require higher specification for air-conditioning equipment. 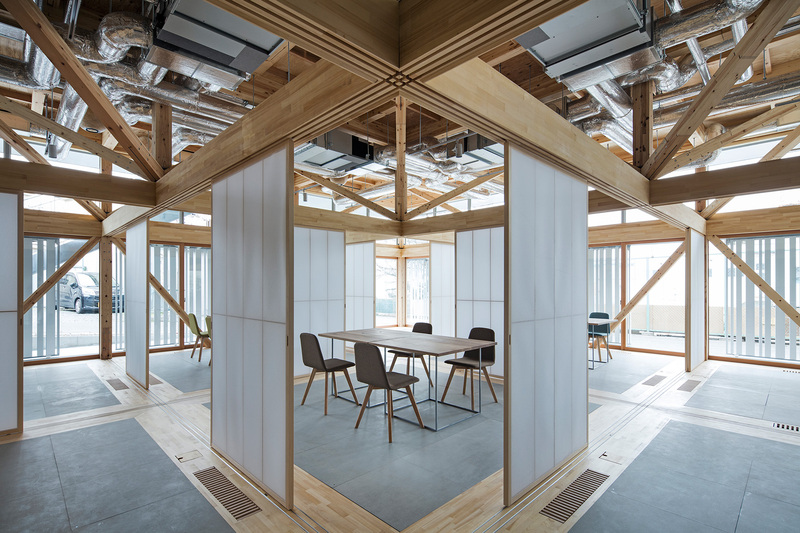 Thus, we divided air-conditioning zones into the living layer and the environmental layer, and only the living layer was designed to be air-conditioned by installing air inlets and outlets on the floor surface to circulate conditioned air within a single grid. 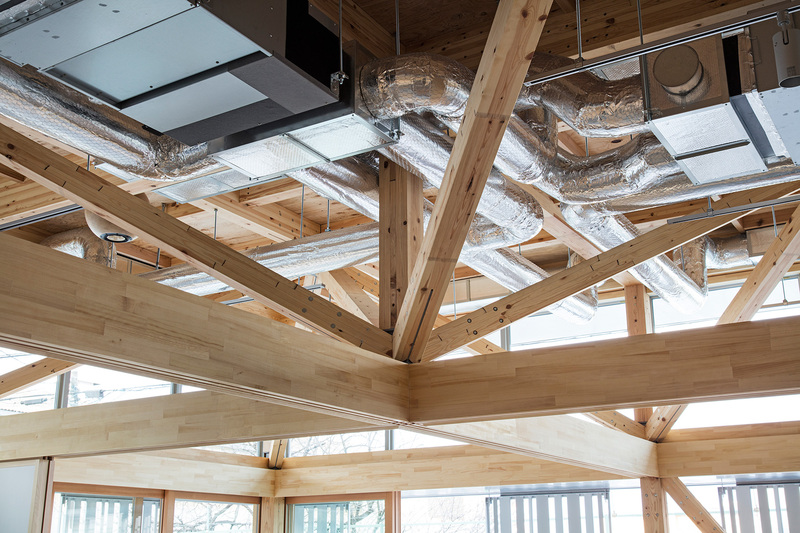 Due to this air-conditioning plan, a high comfort level was achieved using a highly cost effective method without increasing the initial running cost.